India's Mars Orbiter Mission marks the country's first mission to the Red Planet and first entry into interplanetary spaceflight. The unmanned Mars Orbiter Mission, or MOM, will map the surface of the Red Planet and test technologies needed for future Indian space missions. The methane-detecting instrument aboard the ISRO MOM spacecraft has been re-purposed after NASA scientists uncovered a design flaw. Three new spectacular 3D images of a Mars chasm show gullies shaped by erosive forces on the Red Planet. 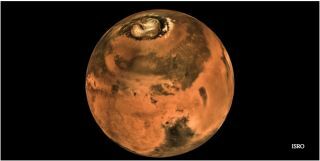 India's first spacecraft to visit Mars has beamed home its greatest photo of the Red Planet yet, a spectacular view that reveals the planet from pole to pole. Two Mars-bound spacecraft are both in excellent health ahead of their September arrivals in orbit around the Red Planet, managers for both missions report. Space feats reached internationally and into interplanetary space in 2013, with milestones stretching from Earth to Mars. A week into its mission, India's Mars probe overcame a bout of engine trouble Monday with an unplanned maneuver to boost its orbit after a rocket firing failed to do its job Sunday.